I had originally planned on ending my TWD break in January, but when I saw that a pecan pie had been chosen...well the break had to end early! I'm always on the lookout for a new pecan pie recipe. I've been baking pecan pies for years, and once I decided that I wasn't satisfied with the recipe on the back on the Karo syrup bottle...well, it's been a neverending quest ever since. 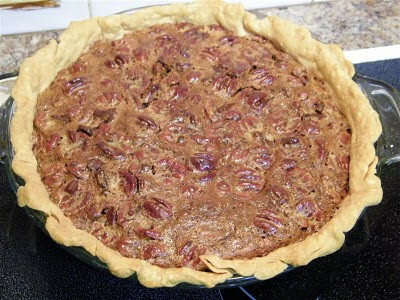 Beth of Someone's in the Kitchen with Brina made the selection for this week, chosing a pie that Dorie lists as her favorite pecan pie. After reading the recipe, I decided that there was no way that my family would actually go for this pie -- it contains espresso powder, cinnamon and chocolate in it!! 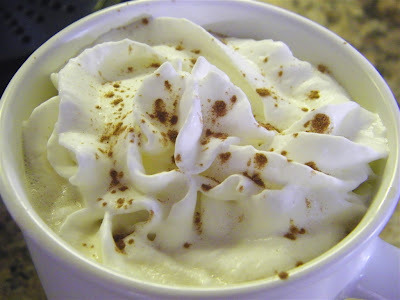 I thought about making it without those ingredients, but then decided just to go for it! It sounded intriguing and I really wanted to try it. I figure I can always make the "plain" version for Christmas if I need to. 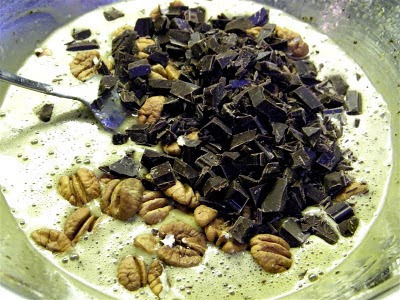 The only change I made in the ingredients was the addition of a tablespoon of flour before adding the pecans and chocolate. Also, I did not partially bake the crust before filling. I knew that I would be increasing the cooking time (I wound up cooking it an additional 10 minutes at the lower temperature). This seems to be a constant issue that I have with pecan pie recipes. I don't know if it's my oven, the weather, the altitude, or if I just don't hold my tongue right when placing it in the oven, but it never sets up correctly if I don't bake it long enough. The tricky part is not overbaking it in the process...which I have done before!! To be quite honest, I wasn't sure how I was going to feel about this pecan pie. However, after taking my first bite, I immediately uttered "ohmygoodness." This may be my new favorite pecan pie. 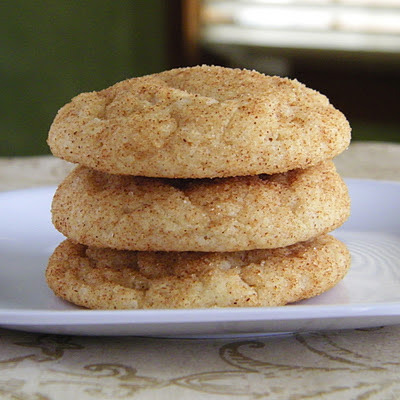 Now I'm anxious to try the plain recipe as well. If it turns out anything like this one, I think my family will be pleased! I'm just going to tell D that this one is a chocolate-pecan pie, carefully omitting the fact that it has espresso powder in it. If I divulge that secret beforehand, I am quite certain he won't even try it! Be sure to check out what the other TWD bakers did with this week's choice, and for the full recipe, click here! The pie looks great and very chocolaty! I was going to tell you on your quest for the best pecan pie to look over at Cookie Madness because I knew Anna was recently posting about them, but scrolling down your blog farther, I see that you already knew that! This TWD was my first time making a pecan pie. I love it, but have to be careful not to eat too much! I have never seen such a perfect pie crust - what's the secret? Of all the things I can do, pie crust is something I have never been able to master. Megan...*cough,cough* I'll never share my crust secret. Actually okay...it's called last minute, not feeling like messing with crust, use Pillsbury refrigerated dough. 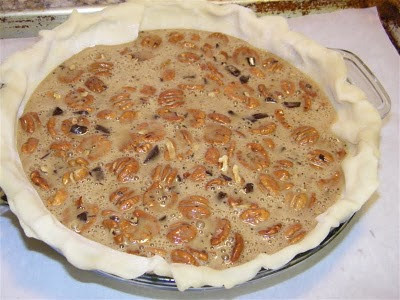 ;) Maybe I'll make the dough for my Christmas pies though, to see if I can still do it, lol. Your pie looks wonderful! 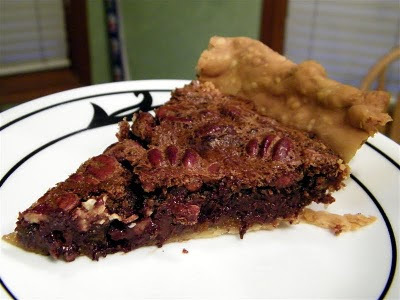 Who would have thought chocolate and espresso would work in a pecan pie.